As a result, Fawnskin’s rapid development slowed to a crawl, and all of the early resorts that once dotted the north shore of the lake, except for one, eventually disappeared into history. Meanwhile, new development along the south side of the lake escalated, and has continued unabated to this day. 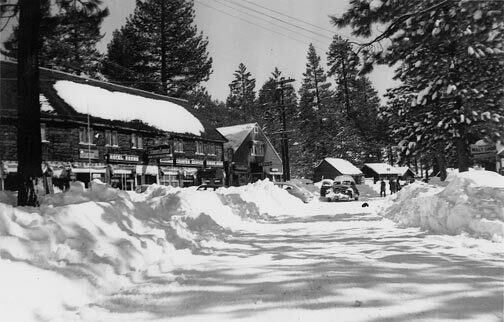 This north/east view shows Fawnskin in the 1940’s. By then, Fawnskin was beginning to look a lot like it does today. – Rick Keppler collection. But you won’t hear any complaints from Fawnskin residents about this. People over there fully appreciate the quiet, peaceful, lay back atmosphere that the north side of the lake offers. Fawnskin is one of Big Bear’s best kept secrets. 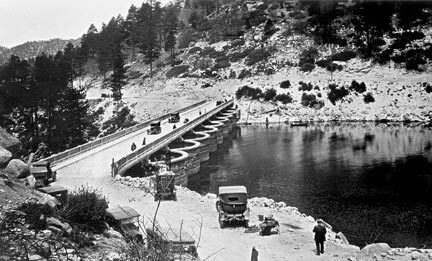 When the bridge was added across the dam in 1924, the majority of traffic to Big Bear began using it to go directly along the Shoth Shore to Big Bear Village. – Rick Keppler collection. Even so, you can’t help wondering what Fawnskin would have looked like today, if the south shore road had never been built.